The topic of horses coat colors markings and patterns is extremely vast. Even very experienced horse men and women continue to learn more and more about the nuance of this topic with the passage of time and experience. In this article, we provide a brief overview of horse coat colors, patterns and markings along with resources that will allow you to dig more deeply into this interesting and complex topic. Read on to learn more. Horses come in many shades of gray that range from nearly white, to a deep gray. Gray horses typically change colors throughout their lifetimes, starting out as dark and lightening to pale gray or even white as they mature. Bay horses are deep reddish brown with black manes and tails, muzzles, ear tips and legs. A buckskin is like a bay horse, but its color is not as dark and deep. Buckskins are typically tan (dark or light) with black legs and black mane and tail. A brown horse is a dark, consistent brown color all over with the exception of his flanks and muzzle, which are typically a lighter shade of brown. These horses usually have black manes and tails. A horse who is entirely black from head to toe with a black mane and tail is considered truly black. Dun horses are tan, reddish or gold. Their manes and tails are black, and they have a dark stripe down the back from the base of the mane to the base of the tail. These horses may also have zebra stripes on the legs. Roan horses are genetically related to Duns. These horses typically have a darker background color with white hairs intermixed. A roan horse’s head, legs, mane and tail is usually a darker shade of the base color. A horse whose darker base color is red is said to be a red roan. A horse whose darker base color is black is said to be a blue roan. These horses are golden with white manes and tails. Chestnuts come in various shades of red ranging from very light (a.k.a. sorrel) to very dark (a.k.a. liver chestnut). The mane and tail may be the same color as the body or lighter. 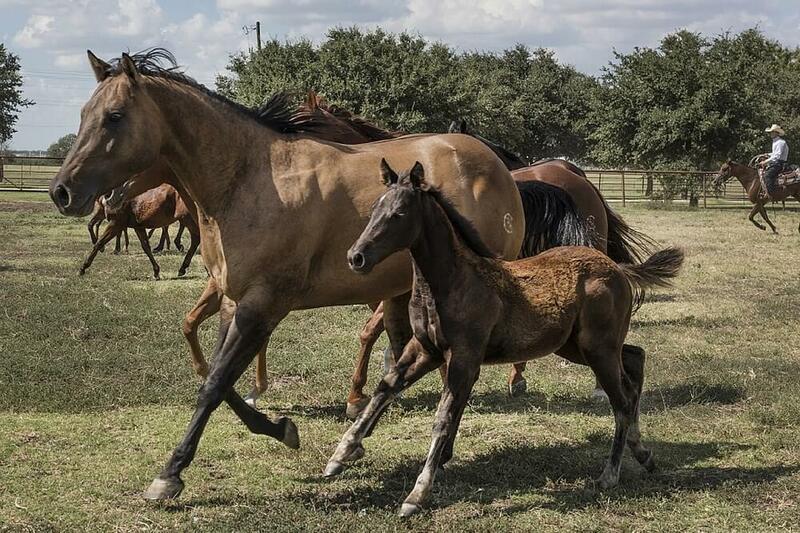 A paint horse is similar to a pinto, but paint is a breed not a color. Only horses that have Thoroughbred or Quarter Horse bloodlines can appropriately be called paints and registered as paint horses. A horse who has a white spot in the center of its forehead is said to have a star. Stars may be small, medium or large and shaped in a variety of ways. A horse with a white spot between its nostrils or low on the muzzle is said to have a snip. A thin, white stripe that runs from forehead to the center of the nose is a strip. 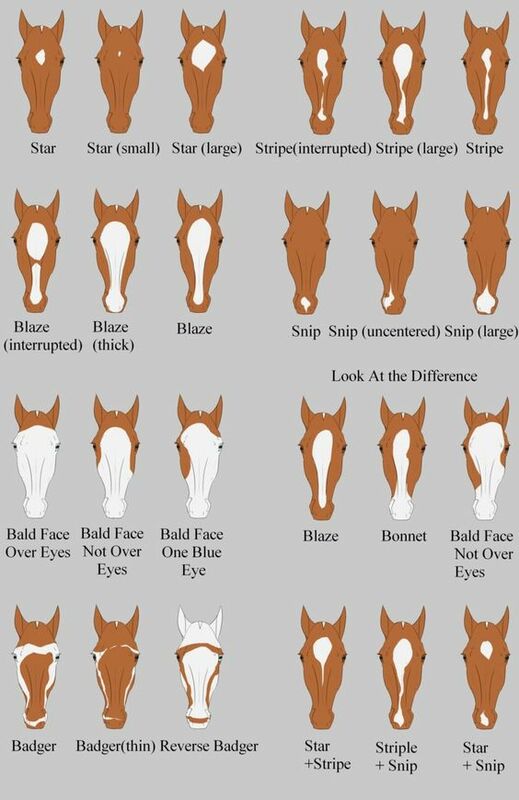 A wider stripe that runs from the forehead to the muzzle is a blaze. A horse with an extremely wide blaze the covers the entire front of the face and may even extend past the eyes is said to be bald-faced. A narrow, white band just above a horse’s hoof is called a Coronet band. This is a slightly wider white band above the hoof. It rises about half-way up the horse’s pastern, stopping before the fetlock. Socks are white markings that extend from the hoof to above the fetlock, no higher than a third of the way up the leg. A white mark that extends from the hoof to high on the leg is called a stocking. Horses such as Appaloosa or Knabstrupper have spots in a color that contrasts with the basic body color (e.g. black spots on a white coat, white spots on a red coat, etc.) An Appaloosa may just have a spotted blanket over his rump, or this coloring may extend over the entire body. Gray horses are often dappled with spots of a slightly darker color throughout the coat. Some horses have zebra-like stripes on their upper legs. This is especially common in dun horses.